From the establishment of Alexandria in 1749 to the present time, African Americans have been a vibrant part of this city's history. The City of Alexandria would not exist in its present form were it not for the economic, social, and cultural contributions of African Americans both slave and free. As Alexandria developed in the 19th century, African Americans began to establish enclaves with distinctive names and characteristics. Many of these areas such as: The Berg, The Bottoms, Cross Canal, Hayti, The Hump, Sunnyside, and Uptown survive today and retain historical significance for African Americans currently living in Alexandria. From these original African American neighborhoods a sense of community developed, which let to the creation of churches, schools, civic and social organizations. these memorial sculptures in this park highlight people and institutions important to Alexandria's African American heritage. remain here. Hooff's Run, which runs through this site provided access to the Potomac River and the town of Alexandria for a variety of traders and retailers. By the middle of the 19th century, railroads provided a new transportation system. Established about 1851, the first railroad in this vicinity was the Orange and Alexandria which passed through this land on its way from the town center to more western ports of Virginia. 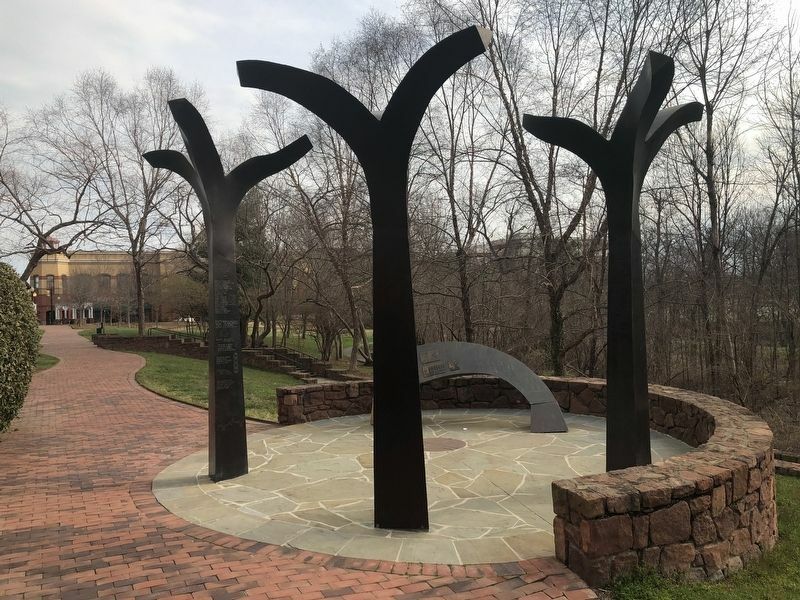 The Norfolk Southern Corporation has set aside this land as a memorial to recognize and celebrate and commemorate African American contributions to the Alexandria community. 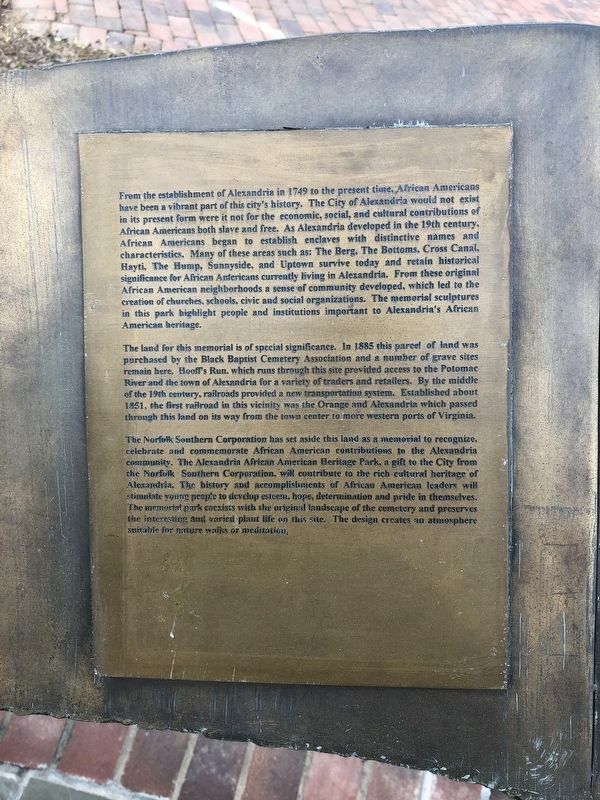 The Alexandria African American Heritage Park, a gift to the City from the Norfolk Southern Corporation, will contribute to the rich cultural heritage of Alexandria. The history and accomplishments of African American leaders will stimulate young people to develop esteem, hope, determination and pride in themselves. 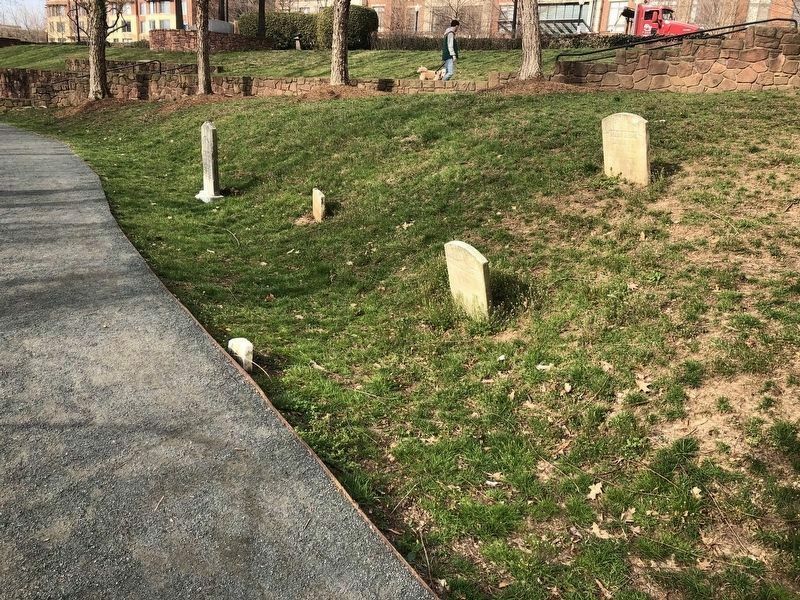 The memorial park coexists with the original landscape of the cemetery and preserves the interesting and varied plant life on this site. The design creates an atmosphere suitable for nature walks or meditation. 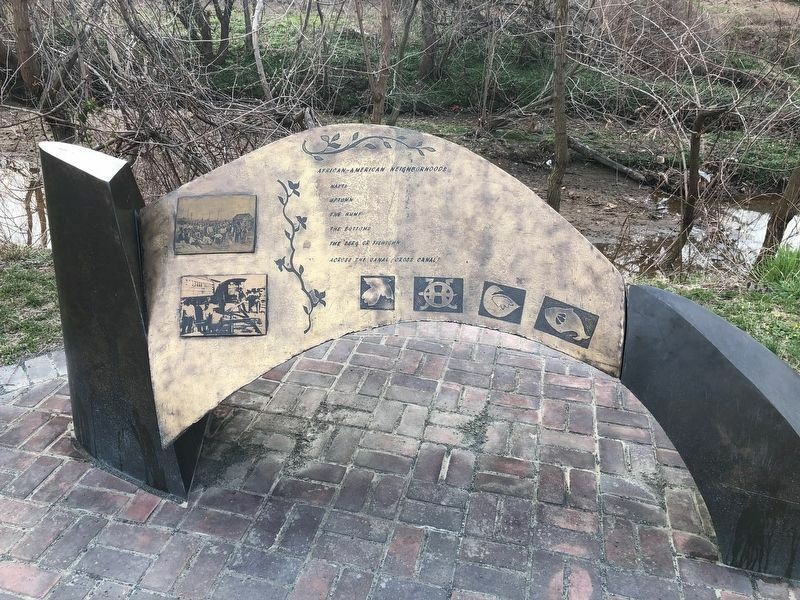 The artistic works incorporated into this Memorial/Park offer symbolic testament to the efforts and accomplishments of a great many local individuals, institutions and organizations both past and present. 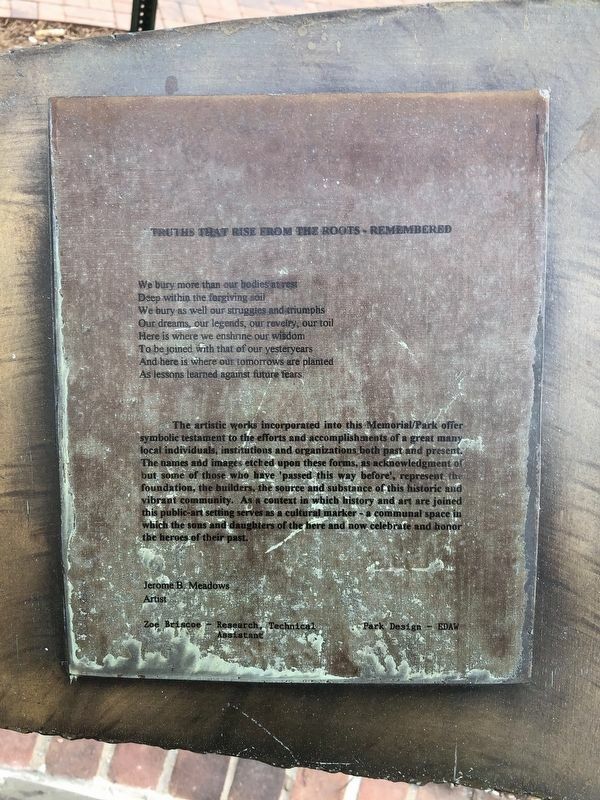 The names and images etched upon these forms, as acknowledgment of but some of those who have 'passed this way before', represent the foundation, the builders, the source and substance of this historic and vibrant community. 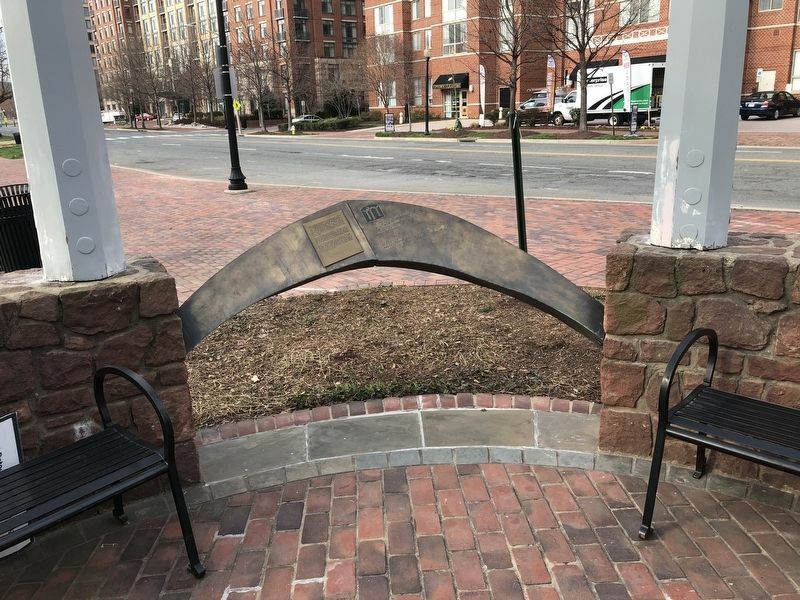 As a context in which history and art are joined this public-art setting serves as a cultural marker — a communal space in which the sons and daughters of the here and now celebrate and honor the heroes of their past. Erected by The Norfolk Southern Corporation. Location. 38° 48.168′ N, 77° 3.582′ W. Marker is in Alexandria, Virginia. Marker is at the intersection of Holland Lane and Jamieson Avenue, on the right when traveling north on Holland Lane. Touch for map. The Memorial is spread out around the grounds of the Alexandria African American Heritage Memorial Park. The start is at the corner of Holland Lane and Jamieson Avenue. Marker is at or near this postal address: 600 Holland Lane, Alexandria VA 22314, United States of America. Touch for directions. Other nearby markers. At least 8 other markers are within walking distance of this marker. Hooff's Run Bridge (about 400 feet away, measured in a direct line); The West End (about 500 feet away); "Pursuers of Booth the Assassin" (about 600 feet away); Alexandria National Cemetery (about 600 feet away); The Duke Street Tanyard (about 600 feet away); A National Cemetery System (about 600 feet away); Old Presbyterian Meeting House (approx. 0.2 miles away); ASIS International 9/11 Memorial (approx. ¼ mile away). Touch for a list and map of all markers in Alexandria. More. Search the internet for African American Heritage Memorial. Credits. This page was last revised on March 29, 2019. This page originally submitted on March 29, 2019, by Devry Becker Jones of Washington, District of Columbia. This page has been viewed 57 times since then. Photos: 1, 2, 3, 4, 5, 6. submitted on March 29, 2019, by Devry Becker Jones of Washington, District of Columbia.